The evolution of solar cell technology has taken center stage recently. Indeed, we have seen rather technical topics and terms appearing down the value chain. Some months ago, we have covered the popular PERC technology. In this article, we would like to put into perspective the differences between p-type and n-type solar cells. Explanations. A few years ago, the underlying technology of solar cells was not particularly featured in the presentation and argumentation of solar panels manufacturers. There was of course companies like Sunpower or Panasonic promoting their different technologies and all the thin-film manufacturers battling over the benefits of CdTe, CIGS or amorphous silicon. But for most of crystalline silicon modules manufacturers, relying on Al-BSF technology, whose incremental evolution was steadily bringing additional efficiency, there was not so much to say. This started to change when the limits of Al-BSF technology, which supported the industry’s growth for four decades, where becoming foreseeable. Then solar cells manufacturers had to make choices to keep pushing efficiencies. We saw trials around Metal Wrap Through architectures, selective emitters were a hot topic for some time. But it is the 30+ years old PERC architecture, which enabled the University of New South Wales to hold the world record for decades, that finally gained traction on the market with a viable concept. While the PERC term started to be mentioned to underline the difference of power with Al-BSF based products and to bring a sense of novelty, it became also usual to state that results were achieved on p-type solar cells because the difference in power was narrowing with n-type solar cells. The argument was then that p-type was cheaper. Today, this distinction between p-type and n-type still holds as manufacturers take different routes along the value chain to compete on efficiency, cost and differentiating value propositions. 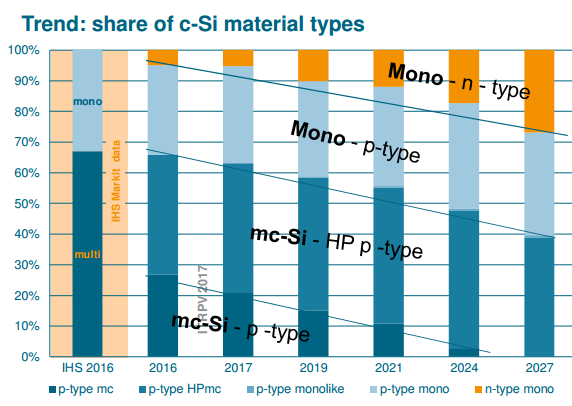 While p-type mono and multi PERC are being developed, n-type wafers capacity is also on the rise, ITRPV forecasting a market share gain, albeit still well under the major technologies. The p-type solar cell is the solar cell structure everyone knows. It held the biggest size of the market for the last four decades. The term p-type refers to the fact that the cell is built on a positively charged (hence p-type) silicon base. Indeed, the wafer is doped with boron, which has one electron less than silicium. The top of the wafer is then negatively doped (n-type) with phosphorous, which has one electron more than silicium. This helps form the p-n junction that will enable the flow of electricity in the cell. n-type solar cells are built the other way around, with the n-type doped side serving as the basis of the solar cell. The first solar cell produced by the Bell Laboratories in 1954 was a n-type, back contact, solar cell. The very first years saw a rapid and important increase of efficiency. Progressively, the p-type structure took the lead, historically because in the early days of its development, the solar technology was mainly used for space applications and it turned out that p-type structure had better resistance to radiations for space applications. Then the industry developed and structured and could enjoy the benefits of economies of scale. So what are the main differences between the two? – Efficiency: most powerful solar cells today available on the market are n-type solar cells. The main reason behind their superior efficiency is the higher carrier lifetime. The technology is not prone to what is called boron-oxygen defect. Indeed, when ingots are grown, they tend to have high concentration of dissolved oxygen coming from the quartz of the crucible where was melted the silicon. In presence of boron doped silicon, this oxygen forms a recombination area, known as boron-oxygen defect, that damages efficiency. When using n-type solar cells, doped with phosphorous, this effect disappears. Also, n-type solar cells are less prone to metallic impurities of the silicon. – Light Induced Degradation effect: n-type solar cells are immune to LID, again because of the absence of the boron-oxygen defect. – Cost: in general, except minor differences, the process to manufacture ingots does not differ much between p-type and n-type solar cells. Then the scale effect is in favor of p-type solar cells. Also, the process of fabrication afterwards includes more steps and makes a module more expensive to build with n-type solar cells. What does it change for modules buyers ? If you remove the scientific jargon, the differences between p-type and n-type do not imply fundamental changes in behavior for module buyers. First, because solar technology, like in other industries, tends to follow an evolution in S-curve. Which means that at some point, newer technologies will replace older technologies. There will be early adopters and laggards, but the rationale of the industry is to improve its technology. The development and adoption of the PERC technology is in this regard a good example. Second, module buyers will always have to choose between product features they value (efficiency, yields, quality, LID resistance, brand…) and the cost. Whatever the technology behind the product, it will always stay true.